The Cruel Sea is one of the coolest things we’ve ever done: a massive expansion set for Second World War at Sea: Bismarck and Arctic Convoy, from our Second Great War alternative-history setting. It was enormous fun to design it, and it should give players enormous fun, too. As far as I know, the Second Great War is unique in board wargames; we’ve followed the model of role-playing games with a unified setting within which the games’ action takes place. The book The Second Great War is the “bible” for our setting, laying out the history that never was (one in which Adolf Hitler lives in a basement with his cat and scrounges for freelance art assignments, having failed at everything he ever attempted. That’s obviously not based on any actual person.). Writing that book first (the first volume has appeared; we’ll release at least one more) made design of The Cruel Sea flow pretty naturally. With the story’s framework in place, the next step was to fill in the details. While it wasn’t exactly easy (it never is), it was far less difficult than other projects have been. The Second Great War is a battleship war, a setting crafted to maximize battleship action – if you’re going to make up your history, make it fit the game you’d want to play (so it has airships, too). In this different reality, Woodrow Wilson brought a negotiated end to the First Great War at the end of 1916. In the Second Great War, the Central Powers (Germany, Austria, Sweden and the Ottoman Empire) have been assailed by the Allied Powers (France, Italy and Russia, with the aid of Serbia, Montenegro and Belgium) in the autumn of 1940. The Cruel Sea is the massive expansion set at the heart of the Second Great War at Sea, our Second World War at Sea alternative-history story arc. It comes with lots of pieces (660 of them) and a set of 30 scenarios. Maps and a very few pieces come from Bismarck and Arctic Convoy. From the designer’s standpoint, that provides a wide-open canvas to create the story you want to tell. I didn’t want to design the same games as Bismarck and Arctic Convoy, just with different-colored pieces. Both the course of the campaigns and the forces involved needed to be unique, and they needed to be different than those of our Plan Z expansion set, which involves the same base games. And so they are. German bases on Iceland, the Faroes Islands and Svalbard significantly alter the battlespace. The Germans are usually faced with a tough task (bringing convoys of needed goods from the United States to Germany, and later to friendly Norway), but they have the powerful High Seas Fleet to protect this commerce, and its Scouting Groups have bases placed snugly athwart the sea lanes. They also have a powerful tool in the Naval Airship Division: a dozen massive, aircraft-carrying zeppelins able to range across the North Atlantic and the Arctic. Where the airships excel is in strategic reconnaissance – using their range and endurance to keep an enemy fleet sighted, bringing their own heavy ships to meet them in surface battle. In addition to locating enemy task forces, they can attack them with their Heinkel He.50 dive bombers. They’re not going to do massive damage with their bombers – they can only carry two steps each (a dozen aircraft, total) and the He.50, though called a “Stuka,” is no Stuka. It’s pretty effective against helpless merchant ships, but it’s not going to smash battleships on its own. However, the French and Russians have little defense against the German airships, beyond the three Russian airships and their attendant fighter planes. Once the British join the war in the next volume, they and their aircraft carriers will pose a considerable challenge to German aerial dominance. The scenarios also differ in the sheer size of the fleets involved. In Bismarck and Arctic Convoy, the Germans at best have one modern fast battleship, sometimes augmented by one or two undersized battle cruisers. In The Cruel Sea, the High Seas Fleet has fourteen modern fast battleships and battle cruisers, with 36 more modernized older ships. Since they’re usually the ones defending their convoy lanes they need an edge in numbers to carry out that mission, but the French alone have 10 modern fast battleships of their own, a single battle cruiser and 15 older ships (some of rather dubious fighting value). The Tsar’s much smaller Arctic Fleet has five modern heavy ships and two rebuilt ones. Those fleets dwarf the actual navies of the real Second World War at Sea; the U.S. Navy had ten modern fast battleships by the end of the war and a pair of battle cruisers (though that’s not exactly a fair comparison, as the aircraft carrier had become the arbiter of sea power). This is a reality where the Gun Club’s view of naval combat holds sway, and massed fleets with a dozen or more heavy ships on a side blaze away at one another. Designing a new world meant that I got to design whole fleets of ships. I tried to use actual ship designs wherever possible; all of the French fast battleships and cruisers are actual designs the Marine Nationale intended to build. The Russians are based on Soviet designs (in turn derived from Italian models), while the German battleships are more rational derivatives of the Bismarck pattern (with heavier guns and more conservative power plants); the actual German battleship designs planned to follow Bismarck would not have been approved by a sane government or naval bureaucracy (you can play with them in Plan Z, though); the standard German heavy cruiser is derived from the Admiral Hipper class, given an armament to match its relatively huge size. Since I wanted the battleships to fight one another, rather than serve as targets for clouds of airplanes, I posited a world that has fixed-wing aircraft, but about a decade less advanced than those of our own history. Most of the aircraft are actual planes built or designed in the late 1920’s and early 1930’s. Helicopters, on the other hand, are much more developed and all of them in the game are based on actual designs (like the strange French G.20 high-speed helicopter). I wanted them in the game because helicopters are cool, but also for their prowess in anti-submarine warfare – the battleships are supposed to fight each other, not become targets for u-boats. 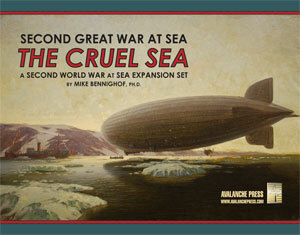 I had a lot of fun designing The Cruel Sea (and creating an entire world!). In terms of its play, it’s built for fun, with lots of surface combat. But I also wanted to weave a compelling story into the scenarios, of a different history that easily could have taken place. I think it succeeds at both of these design goals, and should give you a great deal of enjoyment.